Today’s wireless networks are characterized by fixed spectrum assignment policy. The spectral scarcity and the inefficiency in the spectrum usage necessitate a new communication paradigm to exploit the existing wireless spectrum, opportunistically. Cognitive Radio (CR) is that very paradigm for wireless communication, in which either a network or a wireless node reconfigures its transmission or reception parameters to communicate efficiently avoiding interference with licensed or unlicensed users. CR adapts itself to the newer environment on the basis of its intelligent sensing and captures the best available spectrum to meet user communication requirements. When the radio link features are extended to the network layer, the cognitive radios form the cognitive radio network. 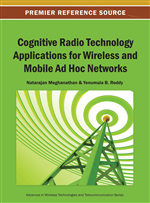 This book chapter is focused on cognitive radio network, architecture of the CR, and its relevance in the wireless and mobile Ad Hoc networks. Wireless spectrum, which is a costly resource, is currently characterized by a Static Spectrum Allocation (SSA) policy, where governmental agencies assign wireless spectrum to license holders on a long term basis for large geographical regions. In recent days with the huge hike in spectrum demand, SSA policy faces spectrum scarcity in particular bands. In contrast, regulatory bodies in various countries (including the Federal Communications Commission in the United States, and Ofcom in the United Kingdom) have found that most of the radio frequency spectrum (FCC, 2003) is inefficiently utilized. For example, cellular network bands are overloaded in most parts of the world, but amateur radio and paging frequencies are not. SSA policy prevents rarely used frequencies (those assigned to specific services) from being used by unlicensed users, even when their transmissions would not interfere at all with the assigned service. This was the reason for allowing unlicensed users to utilize licensed bands whenever it would not cause any interference. This paradigm for wireless communication is known as Cognitive Radio (CR).In other words, CR is the key enabling technology of Dynamic Spectrum Access (DSA) policy which provides the capability to share the wireless channel with licensed users in an opportunistic manner. CR networks are envisioned to provide high bandwidth to mobile users via heterogeneous wireless architectures and DSA techniques. More specifically, the CR technology will enable the users (1) to determine which portions of the spectrum is available and detect the presence of licensed users when a user operates in a licensed band (Spectrum Sensing), (2) select the best available channel (Spectrum Management), (3) coordinate access to this channel with other users (Spectrum Sharing), and (4) vacate the channel when a licensed user is detected (Spectrum Mobility) (Akyildiz, 2006). Role of spectrum in wireless network. Embedding of intelligence within a device and the evolution of the Cognitive Radio. Architecture and working principle of the Cognitive Radio. Different types of the Cognitive Radio Networks. Spectrum sensing, decision and mobility in the Cognitive Radio Network. In the history of the communication system, invention of the radio communication is considered to be a milestone. Radio communication means the transmission of the signals through the free space. Research for such wireless communication started many years ago and many individuals have contributed to this research.